Get Help With File Explorer in Windows 10 Operating System – This tutorial will give you the best guide to use File Explorer on Windows 10 Operating System and if you want to know how to customize File Explorer on Windows 10 Operating System. Windows File Explorer is the latest version of Windows Explorer on Windows 10 Operating System. Microsoft as added lot more features on Windows Explorer and then released the latest version as File Explorer from Windows 8 Operating System. So if you find difficult to customize ten follow the simple guide which will explain you about File Explorer in complete detail. So first let us know about File Explorer in complete detail. Difference between Windows Explorer and new File Explorer. How to Customize File Explorer in Windows 10 Operating System and Keyboard shortcuts on File Explorer. So if you try to open Window Explorer on Windows 7 Operating System, it will open with system drives and then you can start using. But in File Explorer, you can see that File Explorer opens with Quick Access which allows you to access the Windows Folders that you can open instantly as it will not bother about the drivers. File Explorer as a better interface than Windows Explorer as you can navigate easily to any folder you wish. You can also see that OneDrive a cloud storage application is available on the left window of the Windows 10 File Explorer. File Explorer as Home, Share, View labels on the top of the screen which can be easily navigated from the Windows 10 Operating System. File Explorer as an option to see the folder options from File > Options > Open File Explorer To. 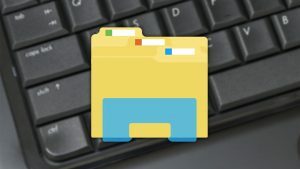 So if you want to know much more about the File Explorer then you can refer to other article called Windows 10 File Explorer from this blog. To customize File Explorer on your Windows 10 Operating System you need to use Quick Access. 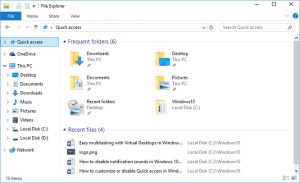 Quick Access can be used to find the folder easily on your Windows 10 OS and then you can also remove the unwanted folder from the Quick Access folder by just one click. You can also pin any folders from the Quick Access as you need to right-click and then choose an option called Pin to Quick Access and also you can Unpin the folder from Quick Access bar. OneDrive is a cloud storage platform which you can store data directly from the computer and then access it from anywhere when required. So you need to Sign In and then store the data in it. Windows Key + E – To Open File Explorer on Windows 10 OS. Alt + Left Arrow – To Go Back One Folder in history. Alt + Up Arrow – To Go Up One Folder in the Folder Tree. Ctrl + N – To Open a File Explorer Window. Ctrl + E – To Activate the Search Bar. Ctrl + Mouse Wheel Up or Mouse Wheel Down – To increase or decrease the size of icons and thumbnails on your Windows 10 OS. So these are the brief information about the File Explorer on Windows 10 Operating System. If you wish to know much more then you can try to access the File Explorer on your Windows 10 Operating System.